The Grandstream UCM6102 IP PBX is a user-friendly device designed with numerous enterprise-grade features. It is equally good for small and medium business organizations. It has an advanced hardware platform with a turnkey solution for high-quality audio and video calls, the security of data and easy configuration. The UCM6100 offers zero configuration and secure web-browsing. There is no need to worry about the additional cost because you will use it without licensing fee and cost per every feature. The series is secure and reliable with an auto-discovery feature of VoIP endpoints. Zero-configuration provisions are also available with this enterprise-grade device. It is an affordable solution of your communication system. The UCM6102 is a full-featured IP-PBX appliance for both small and medium sized business organizations. There is no need to pay any licensing fees because all features will be available for your use without paying any additional fee. The users can get the advantage of easy setup and management. The 6100 series if famous for its simple web interface. Don’t worry about the quality of voice because you can get the support for all major voice codecs and the IAX protocol. 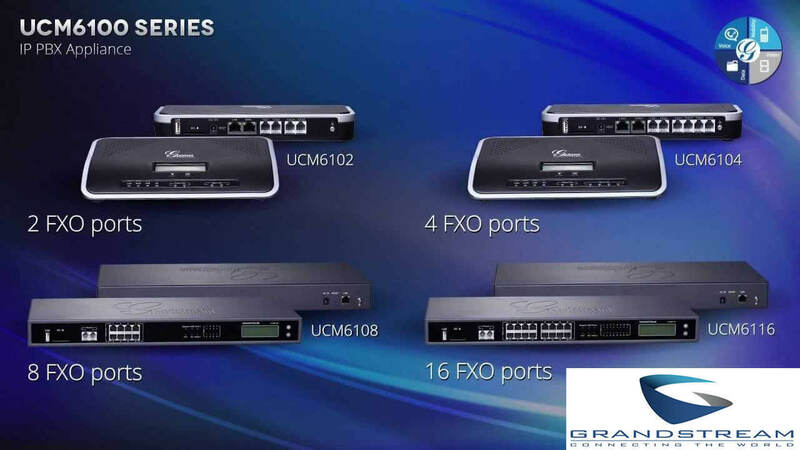 The users of the Grandstream UCM6102 IP PBX can access LDAP phonebooks, call detail records. In the presence of phonebook, there is no need to worry about your important calling numbers and Ids. Additional features include voicemail to email, system backup, and fax capability. It is easy to move from one place to another because of compatible softphone applications, rake numerous office locations, and monitor your business from anywhere. It is now very easy to access the important business files and other data from anywhere. You can manage UCM6100 remotely because of its unique features. The use of this device is extremely secure and reliable because all security features are available, such as 802.1x, HTTPS, TLS and SRTP encryption, as well as K.21 surge protection. It offers a 2-year warranty to offer maximum value of your investment. You can buy Dubai, Abu Dhabi, Sharjah, Ajman, Al Ain & Ras Al Khaimah because it works equally well in these locations. The PBX connection with internal phones will help you to use your traditional network. It is one of the latest phone designed with VoIP PBX. It can use Internet protocols and transmit your calls. It is a software-based phone system that enables you to handle various tasks and deliver high-quality services at an affordable rate. The online portal is designed in simple English, but other options are also available so that you can change its language. You can operate your personal network and get the benefits of its unique features. If you are new to this device, you can set caller ringtones, email addresses, and get the benefits of various other features. Initial set up of the Grandstream UCM6102 Dubai is simple because you can just plug-N-play the setup. With the help of this PBX System , you can get the benefits of 500 extensions and make 30 simultaneous calls. Get the advantage of three conference bridges and 25 simultaneous PSTN or IP participants. The support of T.30/T.38 fax and fax pass-thru is available. It is a good and functional device for business communications. With the help of some special configurations, you can easily customize the components of this device. You can get the advantage of auto provisioning and set it to your phones without any hassle. It is compatible to your Cisco, Snom, Yealink, Astra, and Polycom. The system can be run on a customized base with a lot of advanced functions. If you are not happy with your current communications system, you can increase its efficiency by joining it with Grandstream UCM6102 IP PBX. The Grandstream UCM6102 IP PBX works as a base of VoIP system because it can handle IP phones, video phones, and gateways. An advanced line of IP cameras is available for the safety, and you can get the advantage of its basic functions only. If you are a plug and play kind of a person, then UCM6102 IP PBX is an ultimate choice for you. If you are a little bit techie, then configure various options with the help of user-friendly panel and enjoy its advanced functions. It efficiently handles the communication needs of your small and medium business organization. There is no need to worry about its efficiency because you will get similar quality of call even in the times of the heavy volume of calls. You can get its advantage in every situation regardless of network and power failure.